Monster Hunter: World opens like a lot of games: A world-shattering event derails your freshly created character’s life, and they’re thrown directly into a massive fantastical action scene. In this case, the migration of a mountain-sized dragon disrupts your newbie’s pleasant boat ride to an unexplored continent. Your ship destroyed and nothing but a violent ocean below you, you’re stranded on its lava-spewing back and the only way off, your spunky partner informs you, is to leap from its tail and snag a ride on a poor pterodactyl that happens to be swooping around. It’s a loud, showy start that kicks off the game’s hint of a story and teases your later encounters with the lumbering, living volcano. It also isn’t the least bit representative of Monster Hunter: World’s spirit. Your proper introduction to this game’s terrifying, wondrous reality comes a few minutes later. The helpful pterodactyl drops you off in a jungle just outside the camp you were trying to reach all along. You emerge from some brush and see docile herbivores grazing in a shallow stream. Further along the path, some hostile little lizards start nipping at your heels. You shake them, only for your partner to ambushed by their big brother. The giant reptile gives chase as she reaches camp, but now the monster stands between you and safety. Before you can become a Jagras snack, the game goes full Jurassic Park and sends a massive T. rex out of the trees to start beating the hell out of what you now realize is a basically a wimpy oversized iguana. With both monsters distracted, you make a break for the camp, slam the gate shut, and move on. Like the blandly epic opening scene and unlike the freedom found in the rest of the game, this sequence is heavily directed, but in this case, it’s perfectly paced and scripted to introduce the radical force that helps keep Monster Hunter: World exciting: nature. 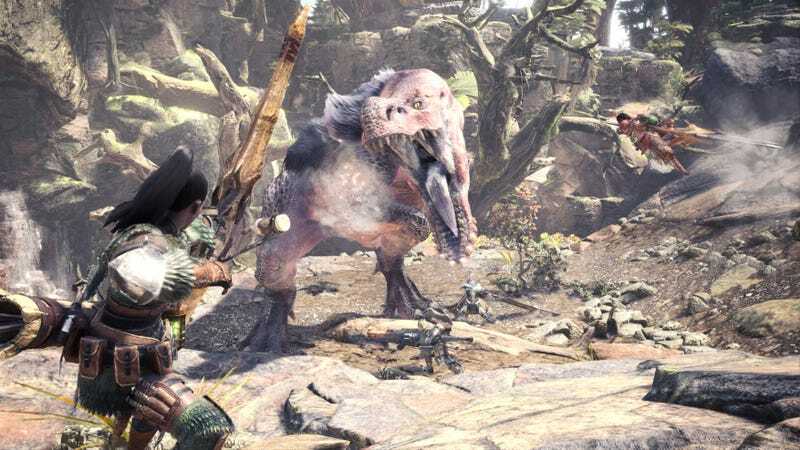 Within minutes, the game establishes that these hunting grounds aren’t just some arena for chasing around fantasy dinosaurs but an ecosystem with a food chain and the orderly chaos it brings. The Anjanath’s welcome interruption was written into the game this time, but as you continue to visit the Ancient Forest, there’s always a chance you’ll wander into its path or, worse, it’ll wander into yours and you’ll be forced to abandon any semblance of a plan you might have had. These beasts care a whole lot more about chowing down on something their own size than bothering with a pest like you. This could work out in your favor, letting a nastier predator do some serious damage to a monster you’re hunting or giving you enough of a distraction to sneak in and get in some safe hits. Then again, if you stick your nose too far into their business, you may become collateral damage. Figuring out how to take advantage of these clashes or recognize that it’s time to hang back and let nature do its thing becomes yet another link in the endless chain of things the game demands you to be constantly considering. But unlike all the more conventional, number-driven factors you have to contend with, the beauty of this extra wrinkle is its basis in the natural world and how it informs the workings of these living places. And there is so much more to the game’s ecology than giant monster fights. World’s locales, greatly varied in their biomes and looks, are full of all kinds of natural interactions. Some, like carrion birds showing up to feast on carcasses or dead dragons falling from the sky into the toxic graveyard of the Rotten Vale, mostly exist to further the character of these environments. Others also help observant hunters who’ve learned to recognize and react to them. If you’re trying to track down a predator, for example, and you see a band of panicked herbivores, you might want to consider running toward whatever they’re running from. There’s even a surprising amount of scientific logic devoted to something as mundane as literal mounds of monster crap. They appear only along the trails of bigger beasts, are sometimes accompanied by adorable dung beetles rolling tiny balls of poo, and you can turn them into stink bombs that send monsters fleeing in disgust. Every creature you see and every material you can collect are afforded a similarly thoughtful place in these ecosystems. It’s only right that a game boiling down to a simple cycle of hunting and crafting from your spoils should derive itself entirely from the laws and cycles of life. Your progression through the game is tied to each ecosystem’s food chain, a predictable force that nonetheless provides World and its unabashedly repetitive routine with a vital sense unpredictability. And the underlying narrative, while not given much attention, is built around the cycle of life, death, and returning to the earth, a theme illustrated through the origins and purposes of the outlandish locations you visit. For a game that can be intimidatingly complex and clinical on the surface, its dedication to depicting nature in its ugly, all-consuming glory is what gives Monster Hunter: World a heart. Well, that and the cat chefs, of course.